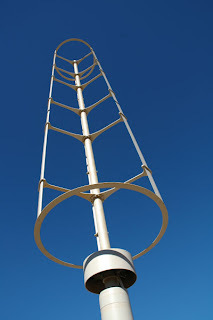 CNet has a good article on small wind turbines. If we could only purchase a couple of these and put them on the roof next to our solar panels that plug directly into our electric meter. Until we upgrade the grid, and how homes connect to that grid, we will always have problems with alternative forms of energy. Google has some great ideas on how to fix this issue. When we can see just how much power we are wasting, we will really be able to start conserving.